The Beach Club resort has a turn of the 20th century New England seaside theme. Decorated in pastel blues and greens, the Beach Club has a relaxing feel. 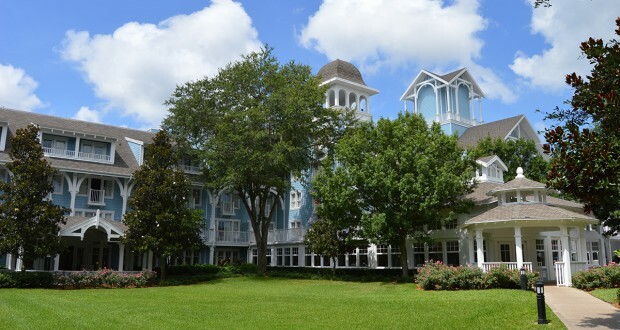 Many of the rooms face the beautiful Crescent Lake, or Stormalong Bay, Disney’s most spectacular hotel pool area. The resort has two restaurants, Beaches and Cream, a 1950’s style malt shop, and Cape May Café, which hosts a nightly clam bake. Nightly rates begin at $350. Connected to the Beach Club Resort, The Yacht Club sports a nautical theme, in a light gray color scheme. There is a quiet, understated elegance here. Like the Beach Club, Yacht Club guests have full access to Stormalong Bay pool complex, and share the same spectacular water views. There are two restaurants on property, the Captain’s Grille, which serves breakfast, lunch, and dinner, and Yachtsman Steakhouse, one of Disney’s premier restaurants. Nightly rates begin at $350. Although the Dolphin is owned and operated by Starwood Resorts and Hotels, guests here enjoy many of the same perks as those staying at a Disney-owned hotel, such as free transportation to the theme parks and extended theme park hours. The Dolphin has a coral and turquoise color scheme, and the main building is a pyramid shaped tower. Two 56-foot Dolphin fountains adorn the roof. The Dolphin shares the spectacular “grotto” pool with its sister resort, the Swan. Restaurants include Shula’s Steakhouse, Todd English’s Bluezoo, a seafood restaurant, and Il Mulino, which serves Italian food. Like its neighbor the Dolphin, the Swan is operated by Starwood Resorts and Hotels, and therefore has only a subtle Disney feel. The Swan is decorated in coral and peach colors, with giant waves on the exterior. Designed by Michael Graves, the Swan features the popular Heavenly Beds. Perched on its rooftop are two graceful swan sculptures. The pool area offers a waterfall, white sand beaches, and a water slide. Restaurants include Garden Grove Café, which hosts a morning character breakfast, and Kimonos, which offers Asian specialties and sushi. Please note: The Swan and Dolphin offer discounts to educators, nurses, and government employees, including military personnel. Nightly rates start at $300. The Boardwalk resort is reminiscent of northeast seaside resorts in the 1920’s. Like its neighbors, the Boardwalk resort sits on beautiful Crescent Lake. The resort also boasts the eye-popping Luna Park pool, including the “Keister Coaster” water slide, set to resemble a wooden roller coaster. Restaurants include the ESPN Club sports bar, Flying Fish Café, and Big River Grille and Brewing Works. Shopping and nightlife are abundant here. Nightly rates begin at $350. The Caribbean Beach resort is one of Disney’s “moderate” resorts. The theming here is lush and tropical, with beautiful white sand beaches. Transportation to all theme parks is via the Disney bus system. The resort offers one pirate-themed main pool and several quiet pools, located around the “islands”. Other amenities here include biking, boating, and fishing. Caribbean Beach resort has two restaurants, Shutters, serving American food, and the Market Street food court. During a recent refurbishment, one section of rooms was re-themed with a pirate motif. Nightly rates start at $150.